The Zeitgeist 2012 or Google’s annual Year in Review is a highly anticipated video and event! The tops 10 searched people, events, videos and more are compiled and shared in a very moving and inspirational video called Zeitgeist. Curious what the heck Zeitgeist is defined as? The Zeitgeist (spirit of the age or spirit of the time) is the intellectual fashion or dominant school of thought which typifies and influences the culture of a period. Zeitgeist is the general cultural, intellectual, ethical, spiritual, or political climate within a nation or even specific groups, along with the general ambiance, morals, sociocultural direction, and mood associated with an era. I wish I could find a copy, but the shortened version of this Year in Review was made for Television and surprisingly showcased me a lot by showing the entire head drop! Wild stuff! I aired on every major network globally on New Years. 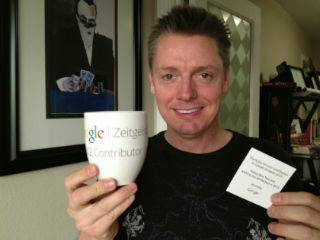 January of 2013, I received a surprise gift from Google as well. Although I have a massive collection of mugs & trinkets, this one is a keeper! It’s going right next to Ellen’s Mug! On a side note, for those interested in numbers, this particular video has a handful of million views on my personal YouTube channel. However, Google bases this Zeiteist off searches everywhere. Quite frankly, a few million views of a YouTube video is nothing compared to the overall searches and views necessary to be on a top 10 list. This video was licensed out to numerous networks such as NBC, ABC, CNN, Yahoo, etc and the searches for this and other videos of mine hit well over 100 million in under a week. The video appears and plays on numerous channels, site and shows globally. So, in the end, I traded exposure on other sites and TV networks for direct traffic to my own YouTube channel. It was well worth it. It’s pretty wild.